International Print Center New York (IPCNY) presents Black Pulp!, an exhibition that examines evolving perspectives of Black identity in American culture and history from 1912 to 2016 through rare historical printed media shown in dialogue with contemporary works of art. The exhibition highlights works by artists, graphic designers, writers, and publishers in formats ranging from little known comic books to covers for historic books and magazines, to etchings, digital prints, drawings, and media-based works by some of today’s leading artists. The exhibition is organized by artists William Villalongo and Mark Thomas Gibson. The exhibition features contemporary works by an intergenerational selection of twenty-one artists from the Black Diaspora. Highlights include Kerry James Marshall’s Dailies from Rythm Mastr (2010), Kara Walker’s Alabama Loyalists Greeting the Federal Gun-Boats from Harper’s Pictorial History of the Civil War (Annotated) (2005), and Renee Cox’s Chillin with Liberty (1998). Other contemporary artists on view are Derrick Adams, Laylah Ali, Firelei Báez, Nayland Blake, Robert Colescott, William Downs, Ellen Gallagher, Trenton Doyle Hancock, Lucia Hierro, Yashua Klos, Wangechi Mutu, Lamar Peterson, Pope.L, Kenny Rivero, Alexandria Smith, Felandus Thames, Hank Willis Thomas, and Fred Wilson. 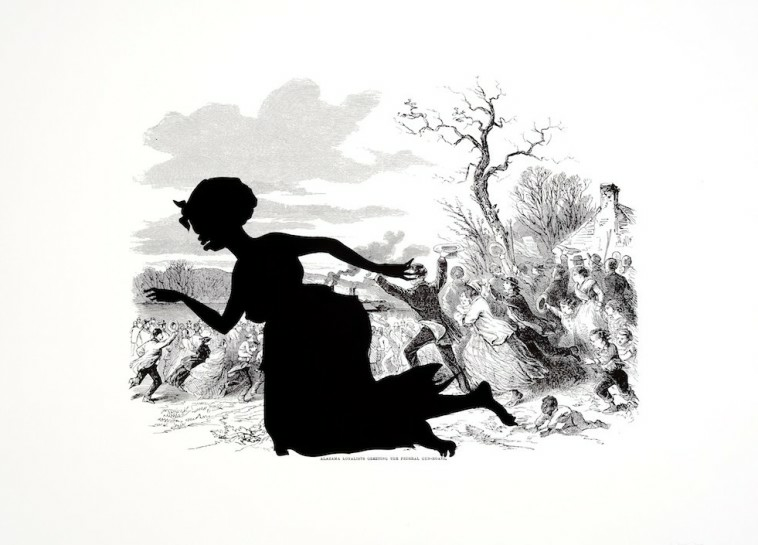 Image: Kara Walker, Alabama Loyalists Greeting the Federal Gun-Boats from Harper’s Pictorial History of the Civil War (Annotated), 2005, offset Lithograph and Silkscreen. Edition: 35, 39 x 53 inches. Published by the LeRoy Neiman Center for Print Studies. © 2016 Kara Walker.